Your notion of a "real" doctor probably conforms to a prototype generated by the mass media. Many have come to think of a doctor as someone who prescribes advice and drugs or performs surgery. Sporting a white lab coat or surgical scrubs with a stethoscope at the neck, doctors are seen as all-knowing, omnipotent and able to save patients in 60 minutes, less commercials. But that's where the similarity ends because each discipline looks at health and healing in very different ways. Clearly, these are two very different philosophies. Yet, each has its place. If you have broken bones or you're bleeding by the side of the road, you want the heroic lifesaving measures of emergency medical treatment. But if you have chronic aches and pains or an interest in wellness, you may want the health restoration possible that is the focus of chiropractic care. Most people are aware of the delicate nature of necks and spines, and therefore only want to entrust their care to a doctor that is properly accredited with respect to spinal, joint, muscular and neurological related conditions. In Ontario, a chiropractor is one of 5 health professionals legally entitled to use the title ‘doctor’. A chiropractor is considered a Primary Care Practitioner – this means we act as a first-contact health care professional, just like your medical doctor. In order for a chiropractor to practice in Canada, they must first complete a pre-medical undergraduate program and then complete a Doctor of Chiropractic (DC) program through an accredited institution. This degree licenses chiropractors as health care providers not only in Canada and the USA, but also internationally. 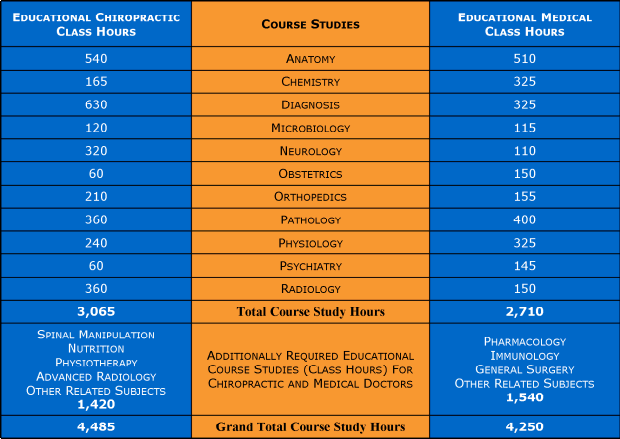 The Doctor of Chiropractic program takes 4+ years to complete and includes at least 4,200 hours of specialized clinical training. After completion of the program (which includes the study of anatomy, physiology, biomechanics, toxicopharmacology, microbiology, neurology, nutrition, radiology, and clinical sciences specifically relating to diagnosis) chiropractors must pass both national and provincial board exams to qualify for a license. To maintain their license, a chiropractor must complete ongoing continuing education (CE) courses to ensure updated knowledge in all aspects of patient care.